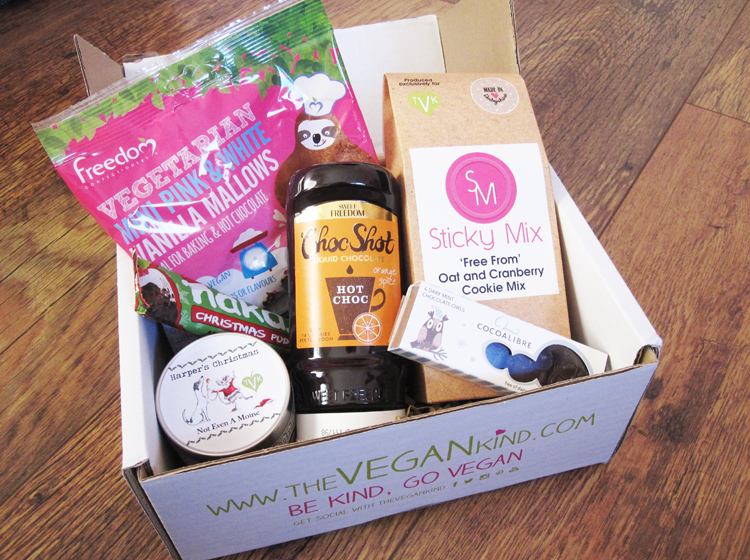 After taking advantage of The Vegan Kind's Black Friday offer on their past boxes, I decided to treat myself further and took out a subscription to their monthly lifestyle box. The December box arrived a few days ago and it did not disappoint! For those if you who haven't heard of The Vegan Kind before, it's a monthly lifestyle subscription box aimed at vegans and those who want to only purchase cruelty-free produce. Each box costs £10 plus £3.15 p&p if you're in the UK, and they also ship abroad for an additional fee. The box contains 5-8 vegan and cruelty-free products (could be a mix of food, toiletries, household etc - always a surprise! ), and TVK guarantee that the value of everything will always be over £10. I'm not a vegan myself, but I am looking at cutting down on my dairy intake so thought this would be a good way to be introduced to some companies that I'm not aware of. The Vegan Kind also offer a Beauty Box which is released every three months and I'm very tempted to sign up for that too, but for now I'll see how I get on with this one! I love dark chocolate, I love mint and I love owls so naturally I was going to love these! Super cute (see below) and surprisingly chunky, these were devoured very quickly after opening. This is a TVK exclusive, free from packet cake mix and it makes up to 12 cookies. You just need to add a butter substitute and water to the mix and then bake them in your oven for 10 minutes. I'm dying to make these so keep an eye on my Instagram where I'll be sharing the results shortly! It wouldn't be a December box without a festive candle and this smells amazing, just like Christmas cake! Made from cruelty free soy wax and housed in a cute tin, it'll burn for around 15 hours so I'm looking forward to scenting my bedroom with this. I've never tried a vegan, gelatine free marshmallow before, but these ones from Freedom taste very similar to regular ones (perhaps even sweeter?) and still melt the same way in hot chocolate. Happy to have discovered these and the sloth chef on the packaging is just adorable. Being a huge fan of Choc Shot, I've already had the pleasure of trying this and I'm thrilled to have it back in my cupboard next to the regular Choc Shot and its' Coconut flavoured sibling. If you've never tried this before, I urge you to pick it up during your next supermarket shop. It's 95% fat free, 100% natural and you can use it for so many different things like in baking, to make a hot chocolate, spread it on toast etc, or you can just squeeze it onto your finger/spoon - I'm not going to judge you! The last product is Nakd's Limited Edition Christmas Pud bar which is simply yummy - it's like a healthy Christmas cake and one I'll definitely be picking up more of. 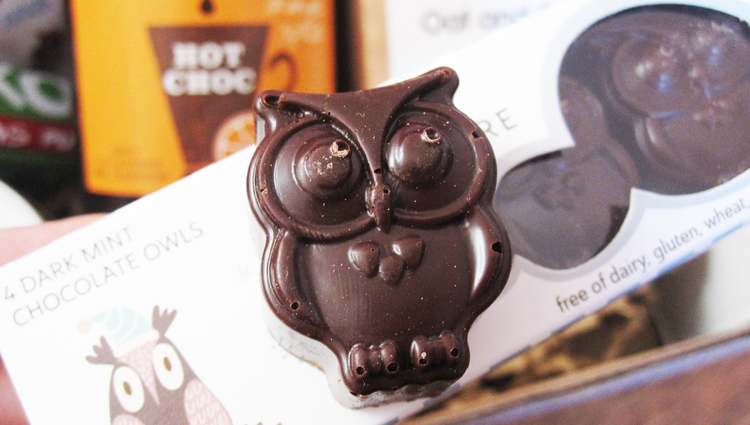 Cocoa Libre Dark Mint Chocolate Owls - mmmmmmm! 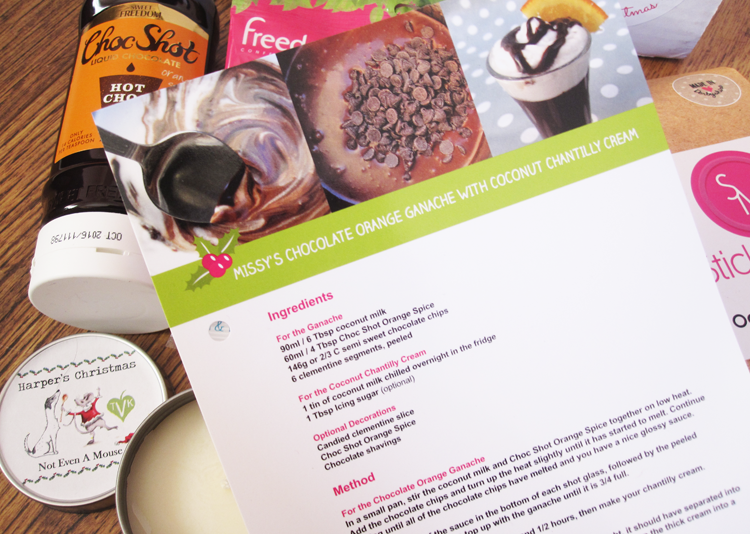 Also included in every TVK box is a vegan recipe card - this month's creation is for a delicious sounding Chocolate Orange Ganache pudding - yum! 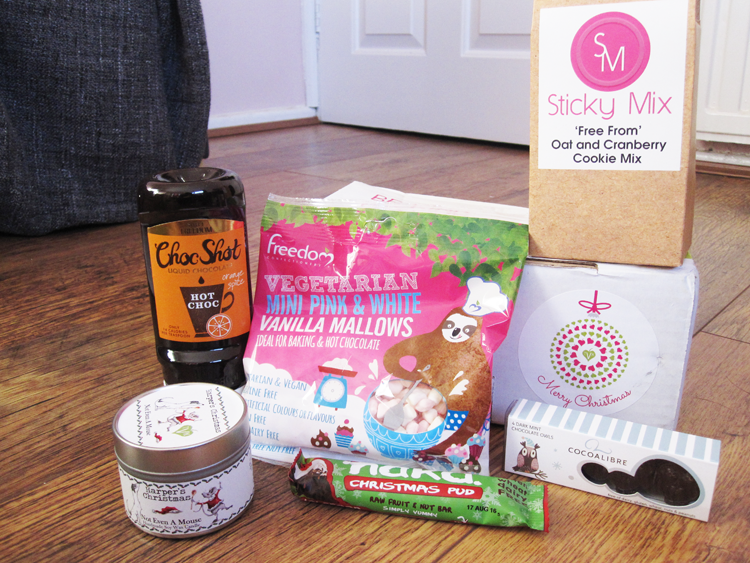 I'm very happy with my December TVK lifestyle box and look forward to January's offering in the New Year. To find out more about The Vegan Kind, visit their website here. This is my kind of box! I've had the Choc Shot and Freedom marshmallows before and they're so delicious! They are so yummy - was really surprised by the Freedom marshmallows!